On a night when alumni from 50 years gone and beyond were on hand to sing it, the Bulldog football team lived up to their fight song’s declaration that they’re “just the kind of team that sets off the crowd” Friday at Bulldog Bowl, returning the opening kickoff for a touchdown and never looking back. 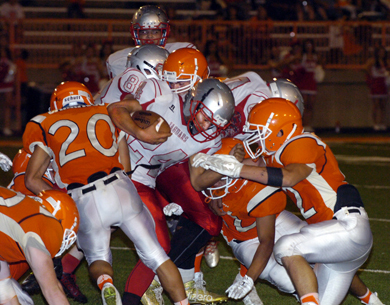 Scoring to cap all but one of their offensive drives and holding the opposing Valencia Jaguars of Los Lunas to just a single score and 122 total yards, the boys in orange romped to their third win in as many games, 42-6. The Bulldogs were able to open up a three-touchdown lead less than halfway through the first quarter, which presented a mental crossroads: concentrate inward against a struggling opponent or lose focus and let up. The ‘Dogs did a solid job of maintaining the former in all phases of the game. 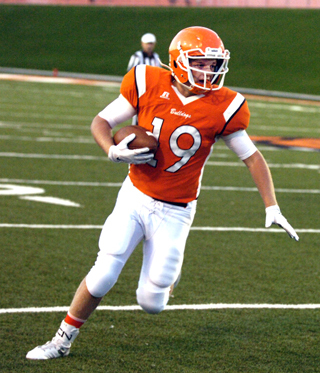 The Bulldogs and their abundance of fans on hand for Homecoming 2015 had something to celebrate just 14 seconds into the game Friday when fleet junior Ethan Duff returned the opening kick 97 yards for a touchdown to give Artesia a quick 7-0 lead following the PAT by Daniel Hernandez. 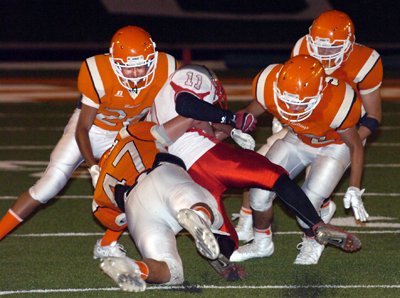 A tackle of Jaguar back Jorge Lopez for a loss of six by Cooper Hall set up a Valencia punt, and two plays later, Artesia was back in the checkerboard on a 30-yard pass from Justin Houghtaling to Isaiah Weideman, who made the catch under pressure. A second Valencia punt was followed by a five-play, 62-yard scoring drive by the ‘Dogs that saw Houghtaling dash off 14 yards before peppering passes to Chaz Matthews, Hernandez and Clay Donaghe. Houghtaling found Donaghe again from five yards out to put Artesia up 21-0 with 6:21 to go in the first. Sophomore linebacker Miguel Martinez wrangled Valencia’s Albert Sanchez for a loss of two on third down to bring about yet another Jaguar punt, and the teams would trade two more before an 11-yard Weideman run on third down set up a 12-yard TD pass from Houghtaling to Hernandez as time ran out on the opening quarter. 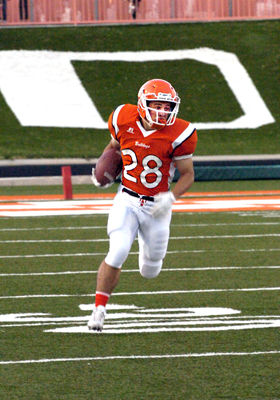 Artesia would make it 35-0 just over two minutes later on a 30-yard touchdown toss from Houghtaling to Duff, who juked and jived his way through the Valencia defense to give the ‘Dogs a five-possession lead. Jaguar quarterback Fermin Lucero attempted his first pass of the night in Valencia’s ensuing drive and senior safety Caleb Brewer made him pay, taking the leaping pick eight yards to the Jag 36. On fourth-and-five from the 21, the Bulldogs opted for a field goal attempt, which was blocked after a shaky hold. Valencia secured its inaugural first down of the game in their next possession on a two-yard run by workhorse Gabriel Kline on fourth-and-one, but time would run out on the drive. 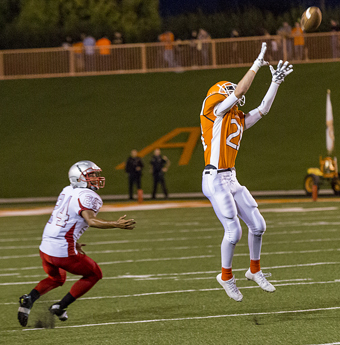 With the mercy-rule clock running from the onset of the second half, a Valencia punt and Artesia’s sixth and final touchdown of the night comprised the third quarter. After hitting Brandon Reza for a 20-yard gain, Houghtaling would pass the ‘Dogs to the Valencia 17, turning Weideman loose for a six-yard gain, then connecting with the junior from the 11 to make it 42-0 with 1:28 left in the third. With the second-team defense on in relief, the Jaguars marched 73 yards on 14 plays to secure their lone touchdown of the night, a five-yard push by Kline. The junior picked up 49 of his total 89 yards in the drive. “The other goal we had coming out last night was to play consistent football, to do stuff consistently well regardless of what the opponent was doing,” Henderson said. The ‘Dogs met that mark, as well, compiling 315 yards of offense in the abbreviated contest, playing solid in the kicking game, and forcing six punts, one turnover, three tackles for a loss of nine total yards, and five stops for no gain. Houghtaling finished his night 17 of 24 for 209 yards passing and five touchdowns. Weideman was 7-68 rushing and 4-47 receiving with two TDs, and Duff caught two passes for 50 yards and one touchdown in addition to a big night on KOR, nearly breaking loose with another kick before being snagged after a 57-yard gain. Hernandez was a perfect 6-6 on PAT. 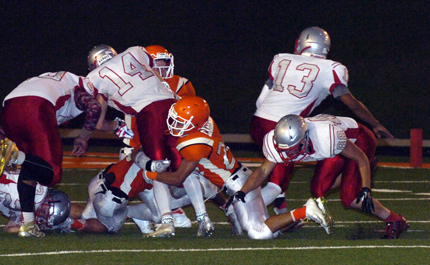 The Bulldogs (3-0) will now prepare for a three-game road trip that begins Friday in Deming. 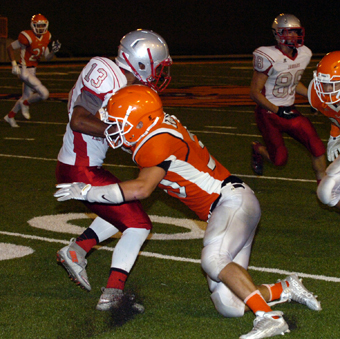 The Class 5A Wildcats improved to 2-1 Friday with a 32-14 victory over Silver in Silver City. Deming bested Carlsbad 41-34 Sept. 4 after opening their 2015 campaign with a 34-20 loss to Flowing Wells in Tucson, Ariz. Following Friday’s outing, the ‘Dogs will head to Carlsbad Sept. 25 for the Eddy County War, then to Las Cruces Oct. 2 to take on the Class 6A Bulldawgs. “Last night’s win puts us moving forward into the next few weeks,” Henderson said. “We’re looking forward to being on the road, getting after some tougher opponents and having some bigger challenges.